Fractions come in all sorts of flavors, and in this tutorial you'll learn how to recognize improper fractions. How Do You Find the Greatest Common Factor of Two Numbers Using Prime Factorization? This tutorial uses something called a factor tree to find the greatest common factor of two numbers. Creating a factor tree for a number makes it easier to find its prime factors. 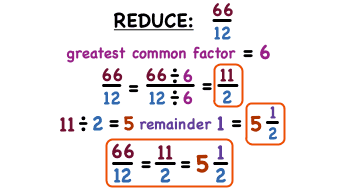 These prime factors are used to help find the greatest common factor. Watch this tutorial and learn how to find the greatest common factor using a factor tree. How Do You Solve an Equation Where You're Multiplying Fractions? Solving an equation with multiple fractions in different forms isn't so bad. This tutorial shows you how to convert a mixed fraction to an improper fraction in order to solve the equation. Then, you'll see how to convert the answer back to a mixed fraction to make sense of it. Follow along with this tutorial to see how it's done!